Time Input doesn’t do anything unless you provide coding for it i.e coding to check current time against ON and OFF times set in the widget. I’ll try and look into Psoro’s scheduler, thx for pointing it out. I got it working with help from analyzing psoro’s scheduler project. I got it boiled down to this… dont know if I could cut more out but its working with the time input widget. I cant turn of “automatic” setting. I am having myself similar problems with timers. 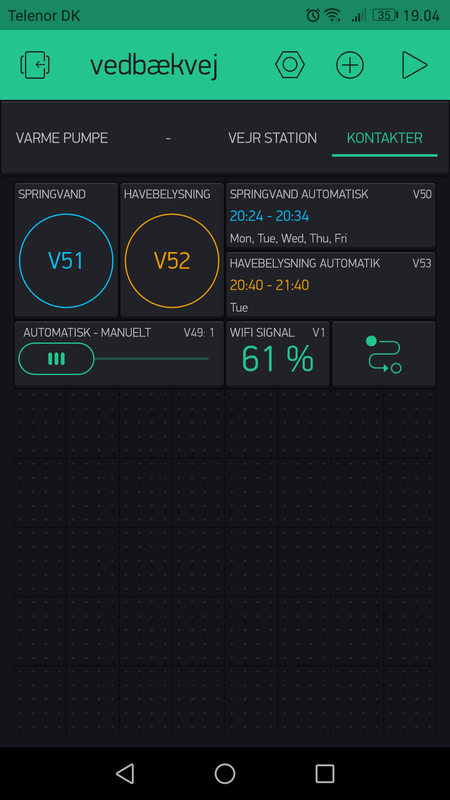 Blynk guys are doing really a great job with the application upgrading, adding very interested and useful widgets all time. (specially for Android). However, if here is something i could suggest to get improved is the timer widget. It would be great if it could work like a time input widget, which to be used as a timer requires a lot of coding in the hardware. It is totally unpractical that to change the time parameter in the timer you have to stop the app running and get into the “programming” to change the time. Besides, I have not discovered yet about why the timers work some times and do not in many other times. Is totally unreliable. In this I can input time, or change it to my needs on the go, is that what you are looking for? Thanks tjohansen, Looks good at first sight. 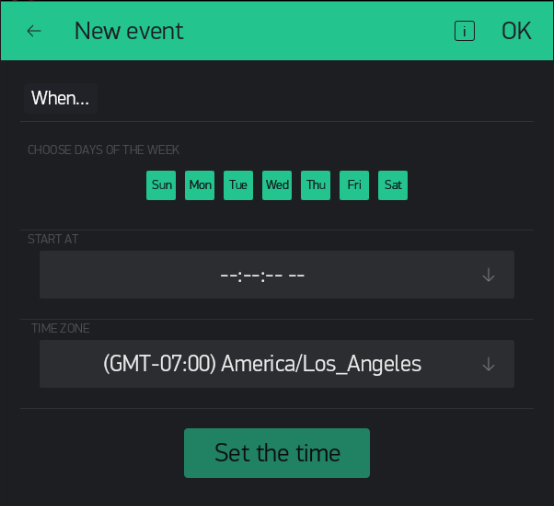 What would it be the response if one the time inputs have all days disabled ? Still, I thought main objective of Blynk was supposedly to reduce the need of coding to the maximum so its accessible to people with non programming expertise. It would be great if “time input” writes a 0 or 1 if conditions are met. I thought main objective of Blynk was supposedly to reduce the need of coding to the maximum so its accessible to people with non programming expertise. I believe that was an initial marketing strategy (and still valid)… And Blynk has many features that can be easily done with minimal or no coding. But anything with this much flexibility and customizable options will always require some degree of skill to maximise it’s potential. Apps for iOs and Android to connect Arduino, Raspberry Pi and similar hardware. Build a beautiful drag-and-drop user interface for your project in less than 5 minutes! "Blynk is a Platform with iOS and Android apps to control Arduino, Raspberry Pi and the likes over the Internet. It’s a digital dashboard where you can build a graphic interface for your project by simply dragging and dropping widgets." Thanks Gunner for your comments. Yeah, from your point of view or my point of view that is perfectly doable, however, if the “timer input” could work as a real timer, my grandma could set the parameters, while I don not see her being able to adjust timer and events. @rmerlob also when you publish your app to the world Eventor will not function for the the end users. This issue with making the Input Timer the way many seem to want it, is that it relies on the App being online (like the Eventor) in order to switch those pins. The current Timer takes the input, sends the data immediately to the Sketch, for processing via code, and then the timing is ready and availed for action, each and every time… even if server connection goes down (assuming coded properly for that). So there are differing options, with differing levels of complexity, that offer differing levels of connection independence. Hopefully your Grandma can use the Time Input widget as per the following revamped sketch. It’s really quite straightforward and easy to incorporate into your own projects. Thanks again @Gunner I realize that I don’t need to code this in my case, 'cos I using ethernet shield I’ll try to use this code to my project and see if it’s work for me. This is my code, but still have issues, please help me!!! digitalWrite(WM1,HIGH);   //write to pin to turn the LED on. digitalWrite(WM1,LOW);   //write to pin to turn the LED off. digitalWrite(WM2,HIGH);   //write to pin to turn the LED on. digitalWrite(WM2,LOW);   //write to pin to turn the LED off. 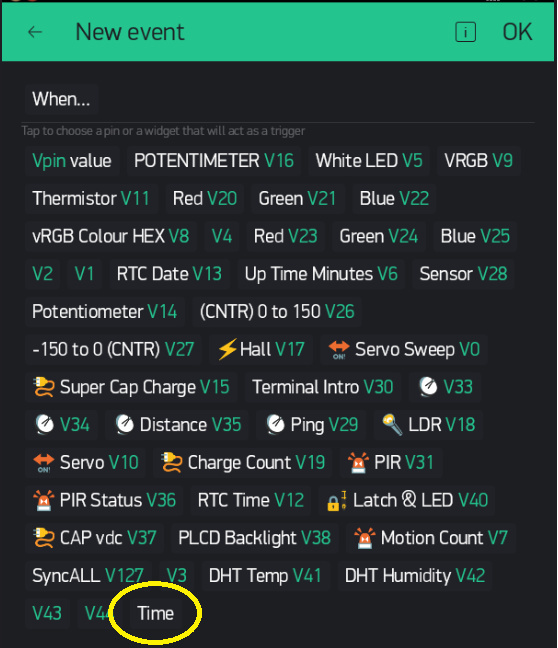 WidgetLED AR(5); //means you need to have LED on app configured on virtual pin 1. WidgetLED AR(5); //means you need to have LED on app configured on virtual pin 5. Works fine for a time, then wen the advanced input timmer run out it crash everything and lost conection.